Menopause, even the surgical kind, is not a disease. A woman's body was created to go through this transition naturally, without interference. However, many women report challenges and symptoms, including hot flashes, night sweats, insomnia, fatigue, and a roller coaster of emotions that leave them feeling overwhelmed, highly stressed, and out of balance. This affects their health, their relationships, and even their passion and sense of purpose. The more symptoms women have, the more hopeless and powerless they feel. Athlete and wellness coach Lori Ann King believes that women have more control over their situation in menopause than they think. 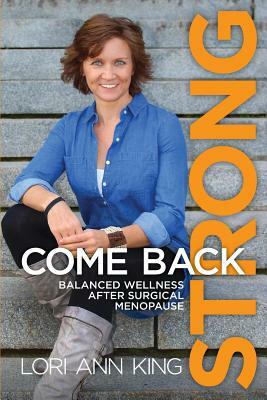 In Come Back Strong, she shares her personal journey with hysterectomy and oophorectomy, which thrust her into sudden surgical menopause--describing the vulnerable parts of her life, marriage, and experience, as well as the joys and celebrations that came from discovering a practical path back to balanced wellness. This book is for you if you've had or you're facing an impending surgery, illness, or treatment that could push you into menopause, or if you know a woman who is experiencing surgically induced menopause and want to learn the best way to support and help her. Full of practical tips and tools to help you release weight, reduce stress, and improve emotional health, as you begin to make choices and lifestyle changes, you'll create habits that strengthen your mind, body, and emotions, find hope and feel empowered like never before.